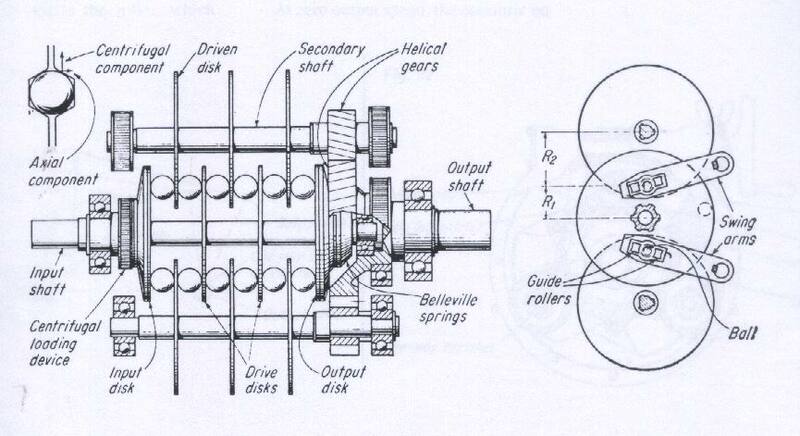 Ball-and-disk drive : Friction disks are mounted on splined shafts to allow axial movement. The steel balls carried by swing arms rotate on guide rollers, and are in contact with driving and driven disks. Belleville springs pro­vide the loading force between the balls and the disks. The position of the balls controls the ratio of contact radii, and thus the speed. Only one pair of disks is required to provide the desired speed ratio; the mul­tiple disks increase the torque capacity. If the load changes, a centrifugal loading device increases or decreases the axial pressure in proportion to the speed. The helical gears permit the output shaft to be coaxial with respect to the input shaft. Output to input speed ratios are from 1 to 1 to 1 to 5, and the drive's efficiency can reach 92%. Small ball and disk drives are rated to 9 hp, and large ball and disk drives are rated to 38 hp.